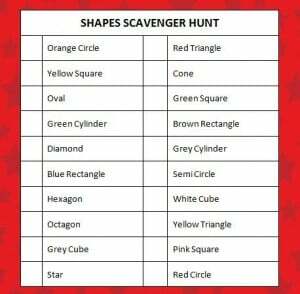 Here’s a fun free printable shapes scavenger hunt that you can print and take along with you on your next walk or on a day of running errands. Have your children point out their findings to you while out on your adventure. How many different shapes can your child identify? Do you know what all of these different shapes look like? Here are a few samples of items you’ll find on the shapes scavenger hunt. For added difficulty, ask your little ones to find specific colors of the different shapes. For example, a red cube or a yellow triangle. There are many places to go for inspiration like your neighborhood playground, the mall, even while driving around the city running errands. Perhaps you have toys at home in different shapes and colors. If so, this could be turned into a rainy day game at home. A construction zone (although not a safe place to play) is an area where you’ll find lots of different shapes and signs. If you happen to be stuck in traffic while waiting to drive through a construction zone, ask your kids to identify the different shapes they see. You could even turn this into a fun game of I Spy. It’s a fun way to pass the time while in traffic! What on-the-go games do your little ones enjoying playing? Let us know in the comments below. For more fun & free printable games, visit our Printable Games page. We have charades, more scavenger hunts, BINGO games, word searches and much more. We’re always adding new ideas and we’d love to share them with you so we hope you’re following along on Facebook, Twitter, Pinterest or our new RSS feed Bloglovin’. Cute! Thanks for sharing, this will be super handy for a fun classroom activity, too.